Any album that has a personal endorsement printed on the sleeve from bluegrass maestro, Tim O’Brien will alert the attention of fans who like their acoustic roots music with a mountain twist. The gist of the endorsement is that Vera Van Heeringen has spent far too long away from the spotlight and this is the release to raise her profile. It doesn’t take many listens to get into the groove of this record with its simplistic sincerity leaving a trail of a bygone age where music was generally free from the complicated distractions of evolution. 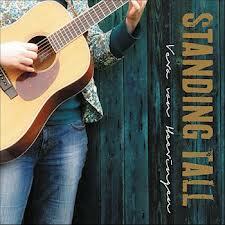 STANDING TALL is the debut album from Vera Van Heeringen whose travels from her Dutch homeland have taken her across the ocean to further her musical education before finally settling in the hills of, not quite North Carolina, but equally as beautiful, North Wales. Her acclaimed acoustic guitar skills have graced a number of acts, both straight and comic, over the last decade in Europe and the UK but the time has arrived to break out and showcase her talents to the fore. With the guiding hand of producer Andy Bell (held with great esteem across the acoustic spectrum) and several other guest contributors, including a very brief appearance from Tim O’Brien himself, the result from this vintage recording session is an outstanding twelve-track collection of music free from adverse impurity. Eleven of the tracks selected are original compositions including four instrumentals that are strategically spaced out to enhance the listening experience. These include ‘Back to Baak/Glebe Reel’ with its, as suggested, Celtic feel to it and ‘The Lorax’ where Vera takes sole credit for its arrangement. Of the tracks adorned by Vera’s soulful vocals, the solitary cover is a respectful re-working of the Carter Family’s ‘Lulu Walls’ that pays tribute to those pioneers of country music who are as relevant for many today as they were nearly eighty years ago. The two most striking songs from the creative pen of Vera are the opening number ‘Old Man’ and the slightly up tempo country-flavoured tune ‘Pass Me the Whiskey’. Both have lyrics and melodies that leave a positive lasting impression. The usual array of traditional instruments are utilised throughout the record including banjo, fiddle, mandolin and double bass, although there’s a little deviation to a modern sound with electric guitar subtlely featuring. However this does not dilute the overall aura of the record paying homage to a traditional way of performing music and Vera Van Heeringen succeeds in joining an increasingly lengthy list of talented exponents keeping the flame well and truly alive.